It’s long been known that Star Wars: A New Hope contains examples of some of the worst marksmanship in the history of cinema, particularly with respect to the Emperor’s ‘elite’ forces. But how bad were they really? Wouldn’t it be awesome if there was a statistical measure of exactly how astonishingly bad imperial stormtroopers were at hitting their mark? Well, fortunately, there is. In the United States, where police forces undergo rigorous (well, at least annual) firearms training, statistics are kept, and made available for, exactly the type of public scrutiny in which we are about to indulge. But first to the question of “How can we calculate the number of shots fired and hits scored by stormtroopers in Star Wars in order to make a valid comparison with real-world figures?” The answer is simple. I counted them. Yes, I did. No, I’m not shitting you. Inspired by the purchase of a brand new TV boasting no less than 55 inches of HD LED OMFGoodness, I took it upon myself to re-watch Star Wars: A New Hope. 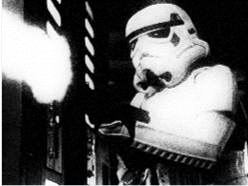 And just for fun – because that’s how I roll – I decided to count each and every shot fired by stormtroopers in the name of generating an accurate hit-rate for comparison with figures issued by the NYPD. Before we get to the nitty gritty of raw statistics, I’ll briefly touch upon some potential excuses given by simpering Empire apologists for the atrocious stormtrooper hit-rate, and deftly debunk them all.